You guys, this summer has been giant! 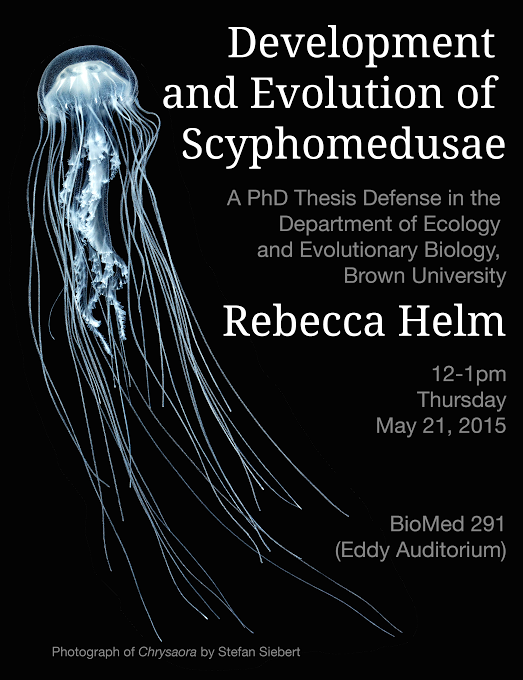 I successfully defended my dissertation, “Development and Evolution of Scyphomedusae” in May. Truly, it was an incredible day. And check out the amazing poster my lab made! My PhD advisor, Casey Dunn, made the poster (he moonlights as a graphic artist, apparently!) Super talented postdoc Stefan Siebert took the photo (more of his pics here). And the jelly? That’s one of mine! An Atlantic stinging nettle (Chrysaora quinquecirrha) I grew it up from a wee ephyra. After that it was time to pack and move all the jellies an hour east, to the lovely Woods Hole, MA. It’s been almost one month since we arrived, where I’m now working as a postdoctoral researcher. The jelly polyps have all settled into their new homes, and are so happy they even made some jelly babies. 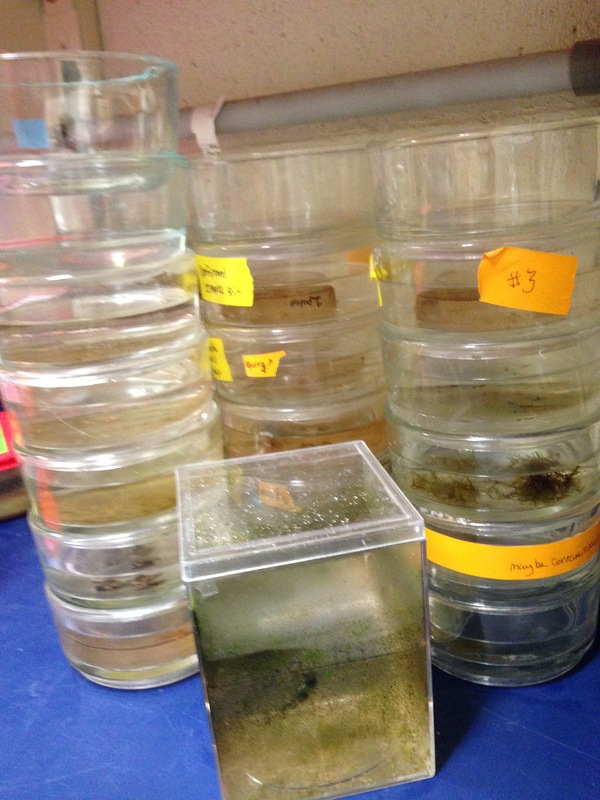 Jelly polyps in their new homes. After years of trying to keep their jars spotless, I’ve finally accepted that not only is algae inevitable, it’s also helpful. So here’s to clean water with lots of photosynthesis! Gelatinous Zooplankton around the world salute you! And to think I knew her when. . . .
Why are you raising Jellyfish Polyps? Because they are part of the jelly life cycle. I love this site. It’s so refreshing. I would like to know how you cultured the jellies. Did you order them, capture and bred, and where did you find the literature for this? Congrats on the phd! Keep up the good work! Thanks. Culturing takes a lot of practice and experimenting, but the resources for this are getting better and better every day. First you can order jellies, though I’ve collected mine from all over (some from fellow researchers, some from orders, some from aquariums, some from breeding, etc). I would check out pbnjellies.com for ordering. For literature, I recommend “How To Keep Jellyfish In Aquariums” (find it here).